This is the year I commit to sparking joy in all aspects of my life, for self-improvement. In addition to my weight-loss/wellness program, I finally decided to correct my teeth. I've never been completely happy with my smile. I have an overbite, a narrow palate and my lower teeth are crowded. (I still have all of my wisdom teeth.) I decided to visit an orthodontist to see if I was a candidate for braces. I made my consultation appointment with Dr. Michelle Neal of Neal Orthodontics in Kirkland, WA. After digital impressions were made (no goop! ), Dr. Neal showed me the Invisalign computer generated model of what my smile would look like if I diligently used my Invisalign retainers for 22 hours each day for 29 weeks.Not only would my smile and bite improve but I would also be able to breathe better. 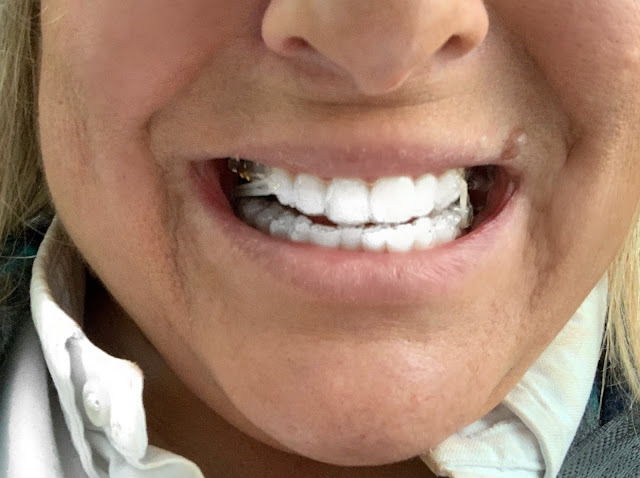 After my initial consultation, three weeks later my Invisalign retainers arrived. At my next orthodontic appointment, I was fitted with the retainers and shown how to care for my teeth and the retainers. Before the retainers were fitted, the technician applied small enamel colored buttons to my teeth which would keep the retainers in place. I also had a Carriere Motion Appliance and several small hooks applied to my teeth to hold elastic bands in place. When she showed me how to put the retainers in, it was more uncomfortable than I expected. It also felt strange to talk with something foreign in my mouth. By the next day though, I had adjusted and my lisp was minimal. The first week was hard. I have never had braces and my teeth were tender. I drank mostly smoothies. I tried to eat salmon one night for dinner and even that was too hard to chew. I stuck mainly with soups and protein shakes for about ten days. It's now been three weeks and I am on my third set of Invisalign retainers. I can already see an improvement in my bite. Yes, I am a little self-conscious about the fact that I have plastic braces, rods and elastic bands as an adult but I know that I am doing something good for myself. It's uncomfortable at the beginning. Each Thursday night when I brush may teeth before bed, I put in a new set of Invisalign retainers and each week it's uncomfortable for a little while. It has to because these braces/retainers are literally moving my teeth in my jaw bones. I take two Tylenol before bed and by Friday morning it feels fine. It just feels like pressure. Is it hard to adjust? It was but the adjustment lasted for less than a week. The hardest part for me were the elastics that go from my lower molars to my canine teeth. It took me awhile to be able to do apply them without snapping the elastics in my mouth which I did dozens of times. Now I have the hang of it. What is it like taking care of the retainers? I keep them in for at least 22 hours a day, removing them just to floss/brush. sip my morning iced coffee and eat meals. When I brush my teeth (first thing in the morning, after breakfast, after lunch, after dinner and before bed), I brush the retainers as well and give them a quick bath in mouthwash. I read that curry or turmeric can stain the enamel colored buttons on your teeth, so I avoid foods with these spices. I don't chew gum or eat popcorn or anything sticky. I don't eat or drink anything expect flat water when the Invisalign retainers are in. I like shakes, smoothies, salmon and soft vegetables. I don't eat raw apples or carrots or anything hard or crunchy. I find it uncomfortable. Why is it sometimes called The Invisalign Diet? -It's work to remove the retainers and brush them and my teeth each time I eat something so I don't eat other than my three main meals. Ever. -I find it uncomfortable to chew crunchy things so snacks like chips, cheese curls (my favorites), sesame sticks etc. are all off the menu. It is but I believe in taking care of my body, mind and soul so whether it's a therapist to talk about my anxiety or a nutritionist to help me lose weight and get fit or an orthodontist to correct my overbite and fix my crowded teeth, I believing in investing in yourself. Any tips you learned so far? -Buy another retainer case. I keep one at home for when I eat and brush my teeth. I also keep one in Waverly's diaper bag. -Never take your retainer out and put it in a napkin. You will forget it's there and throw it out. I bought my bonus retainer case on Amazon. I liked this one because it has a mirror to help me apply the elastic bands and it also has air holes so the retainers dry after I brush them. -If your Invisalign program calls for elastic bands, get extra bags of bands. I have them stashed everywhere so I have no excuse not to use them. -Follow the program exactly as your dentist prescribes. I'll update my progress here as we go along but right now I'm very happy that I decided to finally do this. 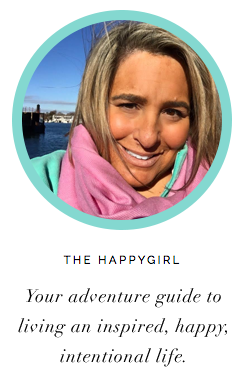 If you've had braces or Invisalign, I'd love to hear your tips on managing the process! I had my two month checkup today and it is going well! I've adapted to the Invisalign retainers better than I expected. 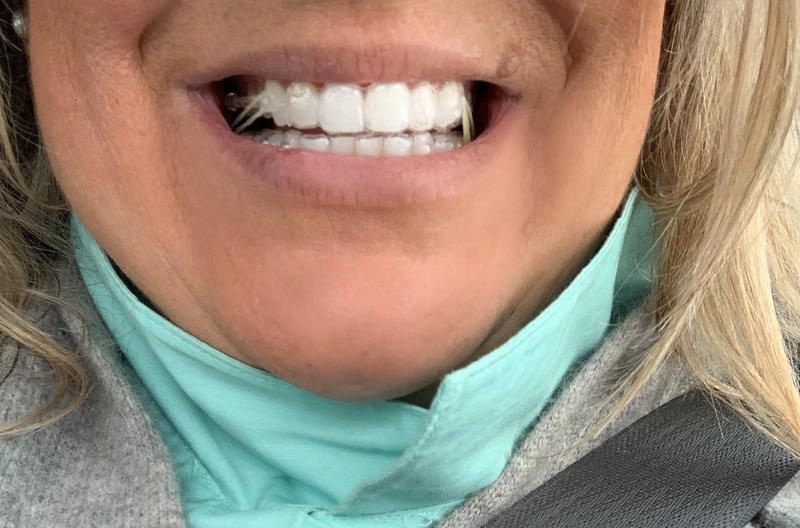 I was a little concerned about what people would think about my braces but now several friends have decided to see if they're candidates for Invisalign as well! If w're ever out and they need elastics, I've got them covered!